For years and years, anybody driving through Muizenberg and onwards along the coast road towards Fish Hoek, would pass the magnificent Labia home, this temple to a past era of grandeur and elegance. The years have been somewhat turbulent for this grand old lady. 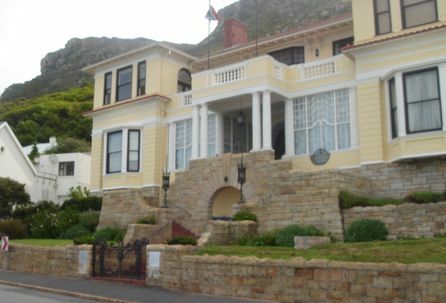 Built in 1929 by Count Natale Labia as a private residence, it also served as an Italian Legation and Embassy. It was designed to reflect the beauty and style of their Venetian palazzo. Grand balls and receptions were held, life had a pace, grace and stateliness befitting the status of a grande dame. After Count and Countess Labia died, the house lay silent and unattended for a time. No wonderful parties, no glittering society affairs with men and women in all their finery dancing the night away in the elegant Italianate ballroom. The years passed. 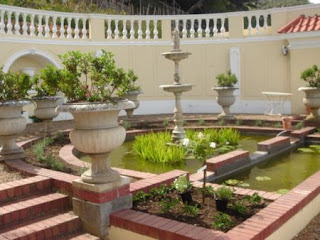 Various foreign governments leased the villa and in1985, the Fort was handed over to the National Gallery, who restored and renovated it and opened it to the public as a museum. It was called the Fort, as the land on which the house had been built had been the site of an old battery to protect False Bay from hostile invaders. Today, the only hostile invaders are huge tourist buses and noisy visitors. And then in 2008, Count Luccio Labia (son of Count Natale Labia) reclaimed the property. With the assistance of his daughter, Antonia Labia Hardres-Williams, the house was lovingly restored. 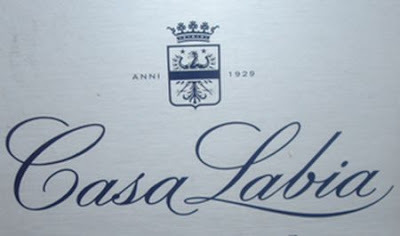 Like the Secret Garden where the flowers blossomed again when the children returned, Casa Labia blossomed when the family Labia returned. Today it glows and puffs out its chest in pride. Life has returned to this lovely place. Within this glorious palazzo is the Casa Labia Café. Very recently Eugene and I visited the Café for lunch. It was a memorable experience. A former reception room has been transformed into an elegant and stylishly informal café. Beautifully decorated in the manner of the house, it opens onto a sheltered courtyard with bougainvillea-covered arches and glimpses of a magnificently landscaped garden beyond. The interior of the restaurant seats 40 and maintains an atmosphere of intimacy. 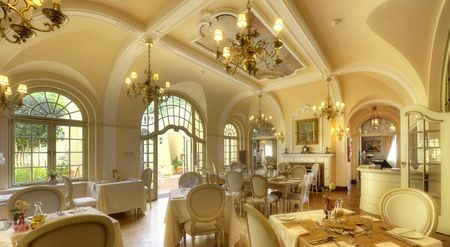 Tables of various sizes, some covered with the palest of pale pink damask linen cloths, others unadorned and showing off their glowing yellow-wood forms, are attended by beautifully upholstered chairs. Roses everywhere, pink on the day that we were there and glimpses of Murano glassware blend with the white and cream and gold of the room. 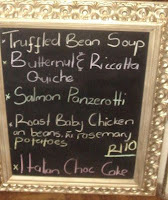 At the door of the restaurant was a small blackboard in an ornate gold frame showing specials of the day. Love the idea of a blackboard in an ornate gold frame! We were shown to a table by a window and settled down to study the menu. Casa Labia Café is a breakfast, lunch and tea place or make it brunch if you wish. 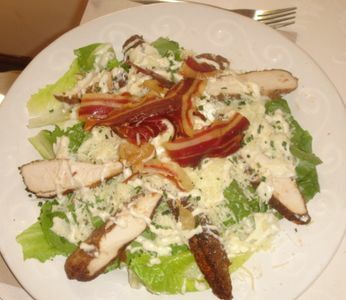 After much dithering, I finally chose the Caesar salad, described on the menu as a "Caesar Salad of Organic Free Range chicken breast with Pancetta, poached egg, garlic croutons and Parmesan dressing (anchovies on the side)". Eugene ordered the soup of the day which was Truffled Bean Soup. To follow, he chose Smoked Tuna with Quail's Eggs, home-grown organic beans, home-made anchovy and caper mayonnaise with salsa verde. Eugene decided to wash all this down with a Peroni beer, and I decided to stay with the fresh water with ice that we found in a sturdy glass decanter on the table. While we waited for our food, we gazed at the loveliness of the place. 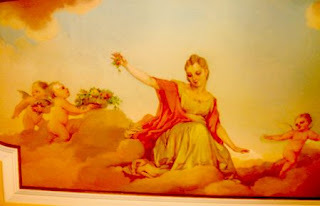 Apart from all that is beautiful, I was particularly entranced by the ceiling painted in the style of the Belle Epoque depicting a luscious maiden frolicking with adorable plump angels and gazing benevolently down on us. I think that she has watched a lot of happy people during her tenure on high. My salad was delicious. Succulent chicken with piles of smokey pancetta hiding a plump poached egg atop masses of crisp salad and adorned with slices of toasted garlic bread and a pungent parmesan dressing. Eugene made short work of the soup and mopped up whatever was left with homemade onion ciabatta. I was still munching my way through my salad when his tuna arrived. Presented as carpaccio, it really is a melt in the mouth experience. He loved it. The menu displays an Italian style of food preparation which, blended with a South African influence, reflects the Labia family's love of both cultures. Brunch and light snacks include homemade scones and muffins, poached and scrambled eggs and Eggs Pavarotti, which are poached eggs with pancetta and red pepper hollandaise. Oh my! 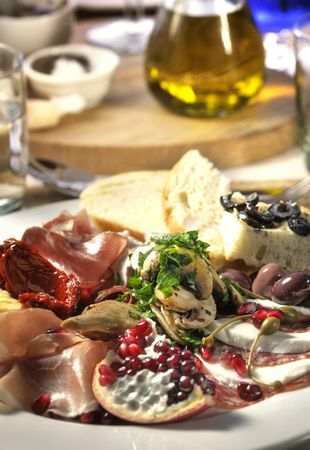 The starters on the lunch menu include an antipasti platter, Melanzane served as a starter or a main course, classic carpaccio of beef fillets, a vegetarian soup and quiche of the day and the lovely smoked tuna dish that Eugene had so enjoyed. The starter portions are all very generous and could easily serve as a main course. The Mains are a tempting array of lovely things. Try the Pasta of the Day or Mushroom Risotto with Truffle Oil or even an Antipasta platter that makes one's mouth water just reading about it. There is a Roast Loin of Lamb with braised vegetables, potatoes, spiced tomato sauce and Aiolo, an organic chicken dish and the amazing Casa Labia Frutti Del Mare. This special treat has calamari, prawns, line fish and mussels in a white wine and cream- herb sauce with a garlic brushetta and chilli on the side. Oh what bliss! There are lovely salads to eat as full meals or as side dishes as well as sandwiches which are all served with Parmesan frites and a salad garnish. There is a carefully chosen Beverage, Bubbly and Wine list, with several wines and bubblies available by the glass as well as gin and tonic and Peroni beer. Everybody has been catered for. The inimitable Judy Badenhorst is the food consultant. Many of us have had our gastronomic lives touched by Judy. The Old Cape Farmstall and The Old Cape Farmstall Cookbook, the River Café at Uitsig, the Lucky Store in Stellenbosch, 'Eight at Spier' and others have all played huge roles in our eating experiences. Now she is working her magic at Casa Labia Café. Robert Sibitz is the head chef and the combination of the skills of these formidable talents creates the joyful eating experience. Judy tells us proudly about their devotion to fresh and local produce. Beautiful herbs and vegetables from their own gardens are used in the Café as well as fresh produce bought locally. Judy expounds on the philosophy of fresh, real, simple food that is flavoursome and honest. No fusion food here! Helen Spreckley cares for the flowers in the grand rooms as well as the restaurant. She and Clifford, the caretaker, are the guardians of the beautifully landscaped gardens. The charming manageress of the café, Tania Mill, told us wonderful tales of the house. The grand ballroom is used as a function room. In fact, they are hosting a wedding there in the near future. Antonia Labia Hardres-Williams, who is fully involved in the care and running of Casa Labia, has a wonderful approach to the treasures of the house. She believes that they are there to be shared with all those who appreciate lovely things. No stuffy attitude, no rails around carpets and special pieces. Upstairs, in what used to be the bedrooms of the house, there is a light airy gallery where the work of contemporary South African artists is shown. Also, the Africa Nova boutique which offers African art and artifacts. We were amazed by the quality of the light streaming through the windows and we gazed in wonderment at the view of the sea beyond. I think that the bygone era must have been quite splendiferous.